A Long Island Rail Road train derailed at Atlantic Terminal in Brooklyn at the height of Wednesday's morning rush, injuring more than 100 people and riddling the track area with shattered glass and debris. 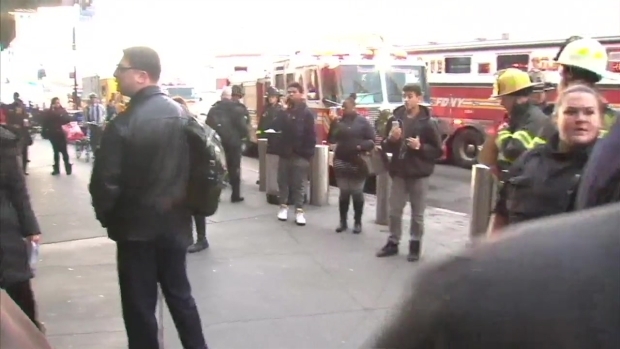 Officials say 103 people were hurt when the six-car train from Far Rockaway struck the bumping block at the terminal's track 6 around 8:30 a.m. The train went up and over the block; the impact knocked the wheels of the first car and one other axle off the rails, MTA Chairman Tom Prendergast said at the scene. "Obviously the train is supposed to stop short of the bumping block," Prendergast, who days ago announced his intent to retire in the upcoming weeks, said. "It did not do that." The train was likely coming in at a fairly low rate of speed -- the posted speed limit on approach to the terminal is 5 mph, according to officials -- at the time of the crash, Gov. Cuomo said. Many riders were standing, prepared to get off, at the time of the derailment. Several passengers complained of neck and back injuries after the accident. Some people were carried away on stretchers; others were sitting outside the train holding ice packs to their heads. Cuomo said it appears the worst injury is a possible broken leg. 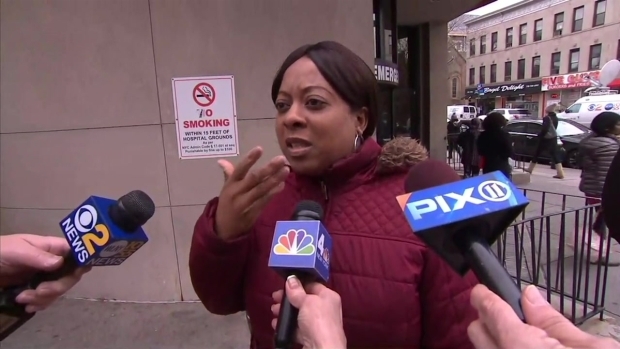 A victim of the Brooklyn train derailment who was in the first carriage describes people with broken bones and teeth falling out in the moments after the train crashed. "This is a relatively minor accident," Cuomo said. "Luckily ... all things considered, this was a relatively minor accident." Mayor de Blasio was at an NYPD crime statistics briefing and did not appear at the crash site. About three hours after the crash, his office tweeted, "Our thoughts are w/ all aboard this morning’s LIRR derailment." An LIRR train derailed at Atlantic Terminal in Brooklyn at the height of Wednesday's morning rush, injuring more than 100 people and scattering debris on the platform. The National Transportation Safety Board says it will take several days of investigation before it can determine what caused a commuter train derailment in New York City. An NTSB spokesman says the train's event recorders have been recovered. He says the train's engineer has undergone drug testing. Results of those tests aren't known yet. Pictures on social media showed the train tipped slightly at an angle. The platform also appeared to be smoky as emergency personnel flooded the scene. NTSB is sending a go-team to NYC today to begin an investigation into this morning's accident there involving the Long Island Railroad. FDNY Deputy Assistant Chief Daniel Donoghue said first responders faced a difficult task, with about 430 people packed on the derailed train. “When we got here a lot of people had fallen because the train actually went through the final bumper and went through a small room in the area at the end of the track," Donoghue said. "A rail actually pierced the bottom of the train, it was fortunate we didn’t have more severe injuries." 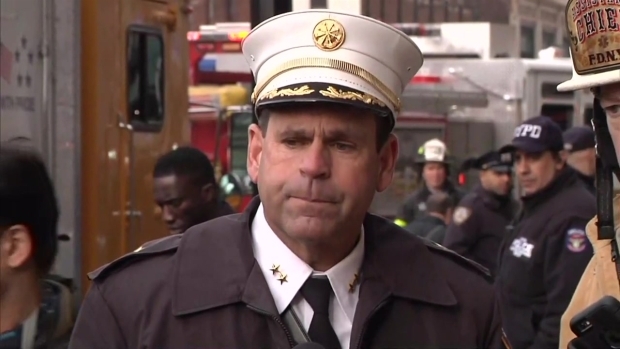 FDNY Deputy Assistant Chief Daniel Donoghue says emergency services faced a difficult task. There were many people to help on the train packed with about 600 – 700 people, and not a lot of first responders on the scene. Aerial NYPD photos showed traffic at a virtual standstill outside the terminal all morning amid a massive emergency presence; buses that normally use the area were detoured. But at 11:36 a.m., LIRR tweeted that service was on or close to schedule in and out of Atlantic Terminal. Passengers described the train pulling into the station, followed by a crash and a loud boom, after which the train's doors opened. "We just heard this loud boom, and people were thrown," recounted passenger Aaron Neufeld. "You're shocked, nobody knows what's going on," he said, adding that he saw a woman wailing on the floor as she bled from her face. Lisa Jackson said, "Next thing I know, I hit my head and my back and I can't remember anything else." 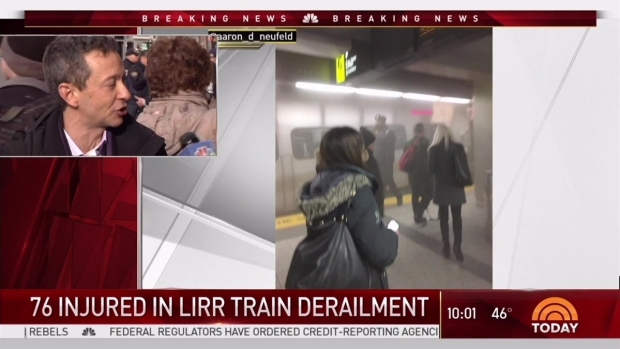 NBC 4 New York's Andrew Siff breaks down the technical details of the train derailment in Brooklyn this morning that injured more than 100 people. The derailment comes about four months after an NJ Transit train crashed into the Hoboken Terminal in New Jersey, killing a woman on the platform and injuring about 100 other people. Cuomo said of the LIRR derailment Wednesday, "This is minor compared to what happened in Hoboken, but the same question: why did the engineer not stop the train?" A preliminary federal report on the Hoboken crash said the five-car train accelerated from 8 to 21 mph — more than twice the speed limit — as it approached the end of the track Sept. 29, before the emergency brake was engaged in the final second. Engineer Thomas Gallagher, who later was found to be suffering from sleep apnea, told investigators he had no memory of the train speeding up. That investigation is ongoing. Last year, the LIRR saw four derailments, according to the Federal Railroad Administration. In 2015, there were nine LIRR derailments, and there were three derailments in 2013 and 2014.